Families impacted by a controversial decision to split a Winnipeg school just got a tutorial in how to ride the bus. 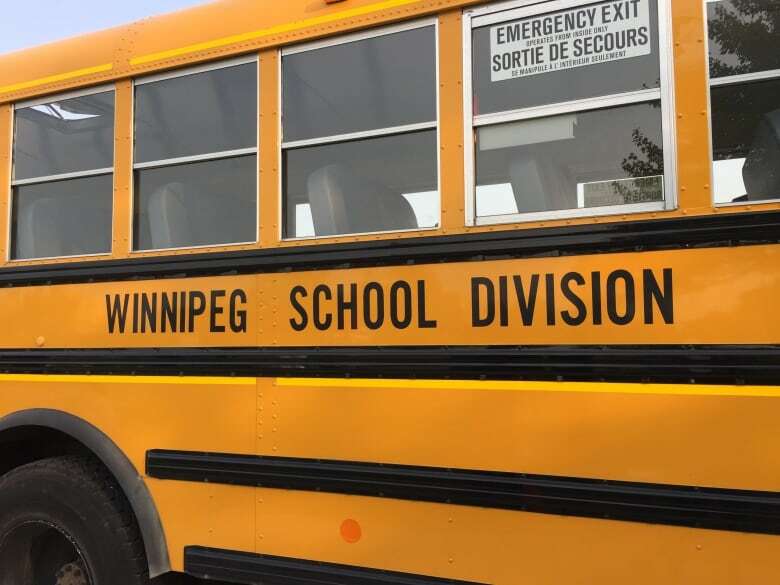 Parents were outraged and confused in May when the Winnipeg School Division (WSD) announced it would be sending younger grades from École LaVérendrye to Sir William Osler Elementary School this September to solve its over-crowding problem. "I think this is a Bandaid. I think it was a poor decision," said Aimee Peake, a parent of two kids who go to École LaVérendrye. At an open house at Grant Park High School on Thursday night, nursery and Grade 1 students from the French immersion school were shown the new buses that will be taking them to Sir William Osler starting Sept. 9. The kids, some of whom have never ridden the bus to school, were shown how to get on and off the buses. Peake's four-year-old son will be busing for the first time when school resumes. His six-year-old sister will remain at École LaVérendrye — a fact that bothers the kids' mother. "You think your kids are going to be in the same building, and see each other at recess and whatnot and it gives them both a sense of safety and belonging to have family at a school," said Peake. "LaVérendrye has always been so wonderful that I was looking forward to having both the kids there." Chris Hiebert, whose son will now be shuttled to Sir William Osler in the mornings, said he has given up hope of a better solution to the over-crowding problem. "I think the school division dropped the ball on this," said Hiebert. "It's just too bad we got stuck being the guinea pigs over the next few years to prime Osler and get it going. It's luck of the draw I guess." Parents were shown the buses' new features at the open house on Thursday. "This year all our buses have cameras, in addition we purchased a package from a company called Zonar and all our buses are equipped with GPS," said Henry Claeys, the transportation supervisor with the WSD. "We purchased a package which allows us to issue each student ... an ID card that can be swiped when they get on and off the bus." Despite the new bus technology, which includes an app for parents that allows them to track things like estimated arrival times, Peake says she still feels like the change is a big inconvenience. "It's not the ideal situation for me. I have one child in each school now. I walk them to school together and one has to get on the bus and go to another building," she said. "If it's just a short-term solution, we'll roll with it. I'm just not sure it will only last the one year that they said it was going to last, so that's a concern as well."